Wonderful Mirror by Fiona Edwards! Christmas tree with all handmade decorations for sale! Thanks to all those who visited during December. We hope lots of you can visit again in May and we look forward to seeing you! 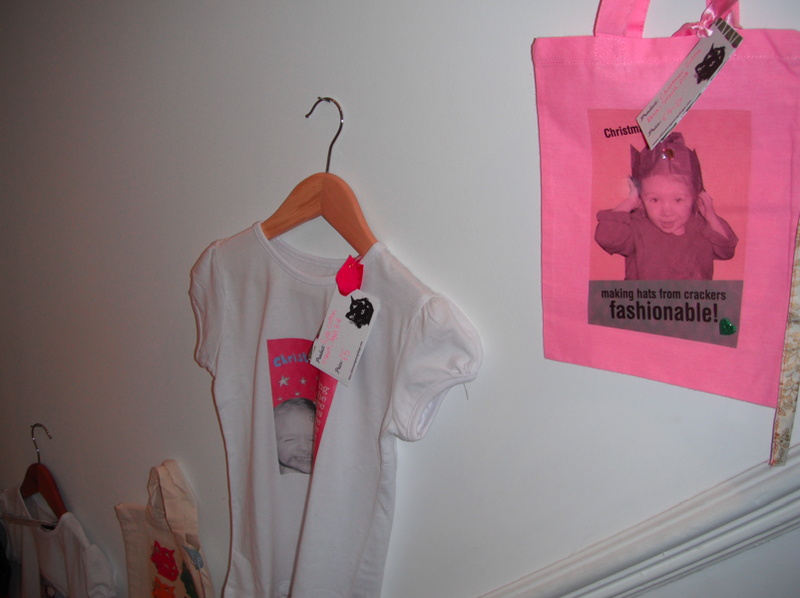 We also have some exciting plans for a blog, facebook and twitter for the house- so keep an eye out for these! 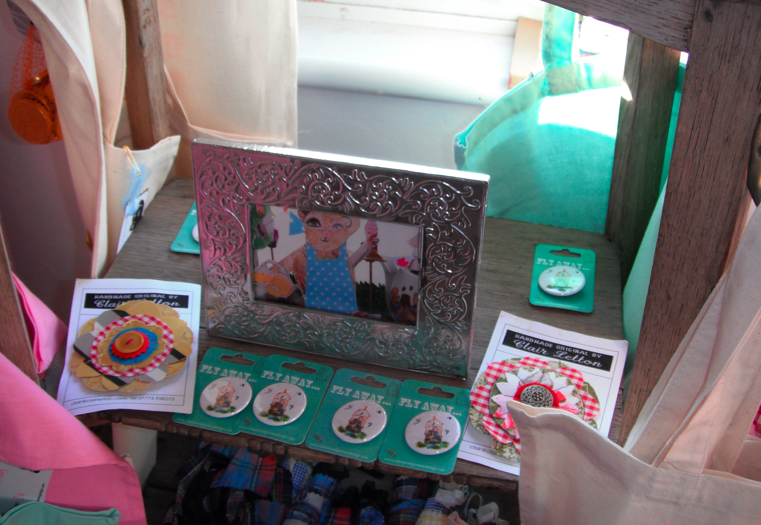 This weekend is the LAST WEEKEND of the Brighton Artists open houses for Christmas 2012! 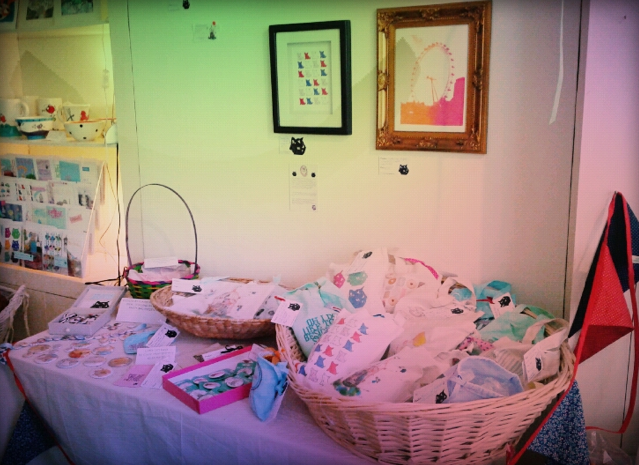 Don’t miss this final chance to get some wonderful handmade gifts, stocking fillers or simply a treat for yourself. There is also cake, mulled wine and more available at most houses to get you feeling festive! 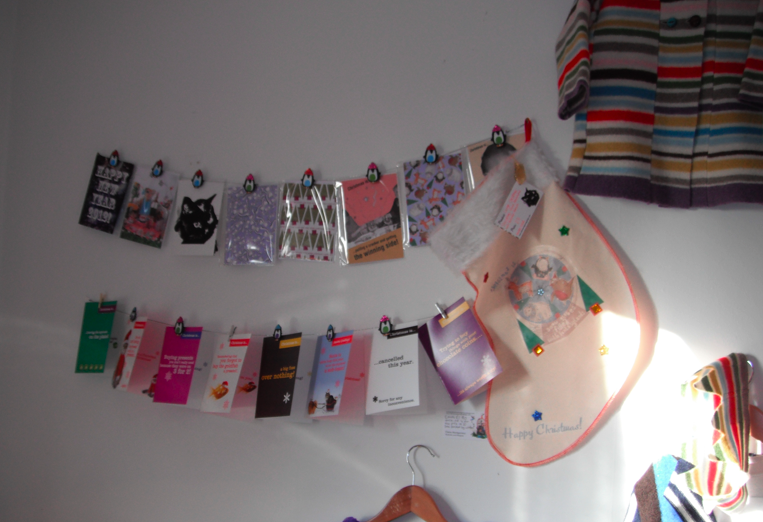 Here are a few photos from Art @73 Stanmer Villas house I am part of, which is Nick Orsborn’s house. I visited last weekend and the house was looking lovely as always! There is over 16 artists exhibiting so there is plenty of work to see- including paintings, jewellery, tree decorations, glass creations, pottery, prints, foxy friends, bags, badges and much more! Houses are open 11am- 5pm , and close their doors this Sunday. 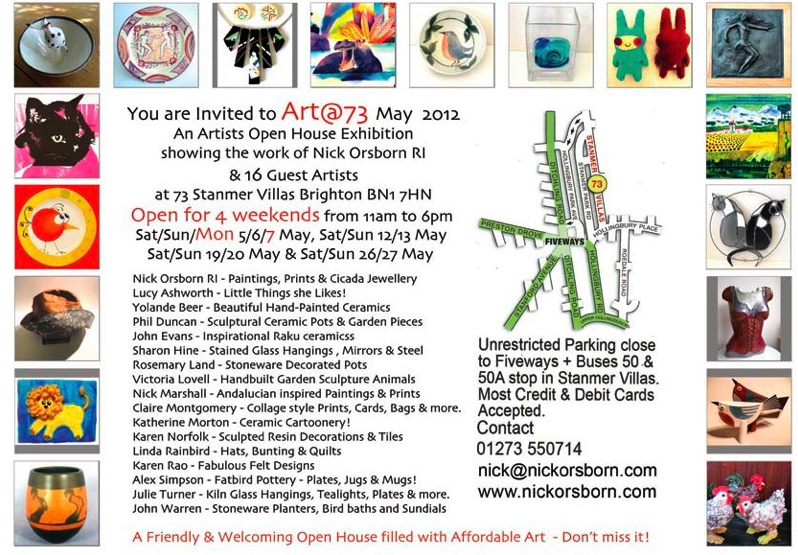 My work is part of the above house 73 Stanmer Villas and also The Cake House (37 Cleveland Road, opposite Blakers park). Both houses are near Fiveways area. 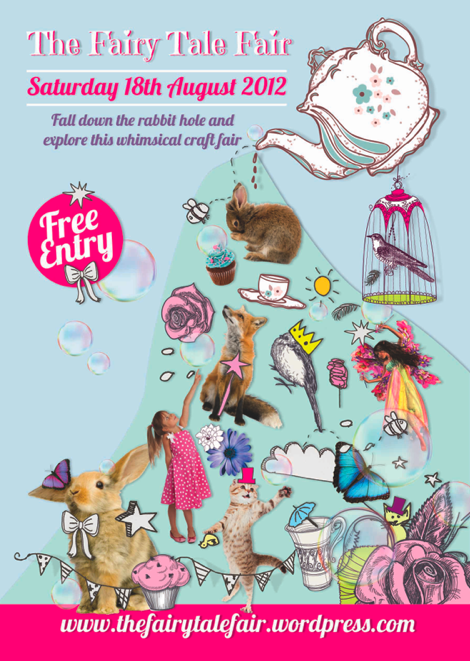 Fall down the rabbit hole and explore this whimsical craft fair I am organising in Brighton on Saturday 18th August 2012 (10.30-5.15pm). 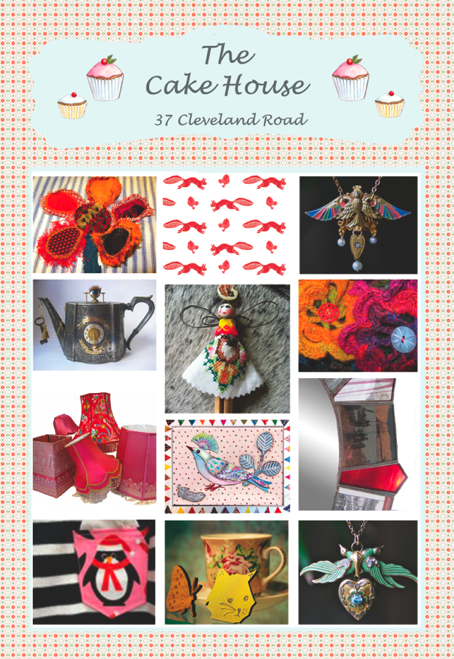 The fair will comprise of 20-25 stalls selling a range of handmade crafts. 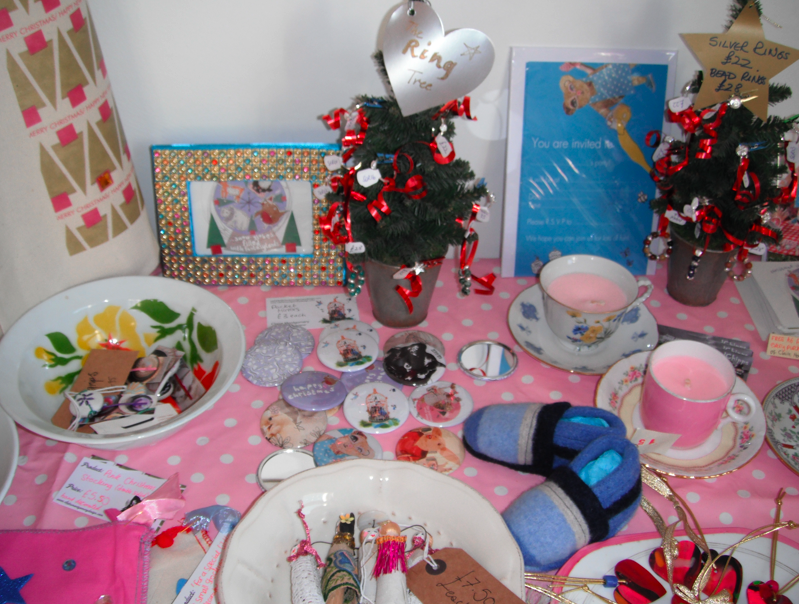 These include jewellery, knitted items, cute characters, cushions, cards, prints, candles, children’s clothes, accessories, vintage style items, hair pieces, bags, decorations, beads and much more. There will also be face painting, beauty, balloon modelling, candy floss and Alice in Wonderland themed cakes with tea and coffee served on vintage china. Entry is also free so why not come along for a great day out for all the family! 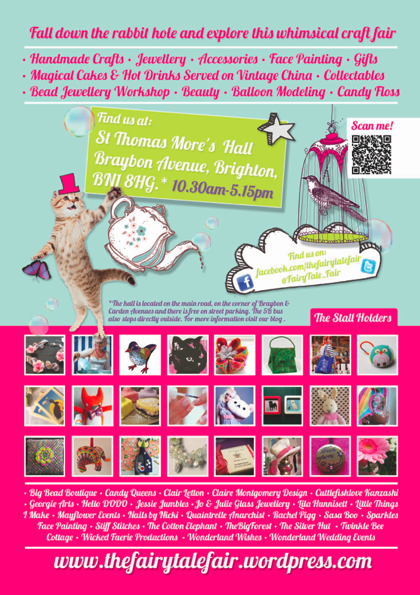 The fair will be located in St Thomas More’s hall on the corner of Braybon and Carden Avenues in Brighton. For full details see The Fairy Tale Fair blog- Click Here. We hope lots of people will come along and hope to see you there! 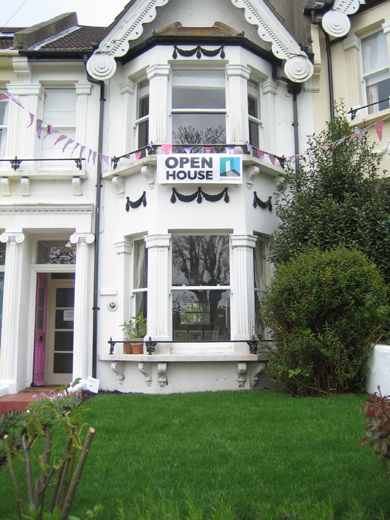 The artists houses are once again open this weekend in Brighton- come along for lots of lovely arts, crafts, cakes and a warm welcome! 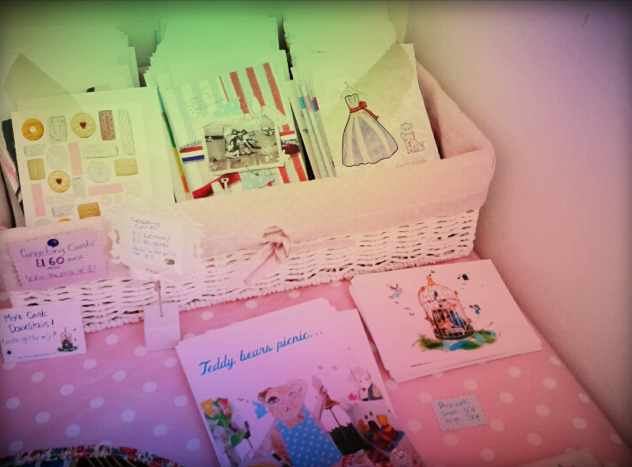 I will be at The Cake House, 37 Cleveland Road, Fiveways, Brighton all day tomorrow. 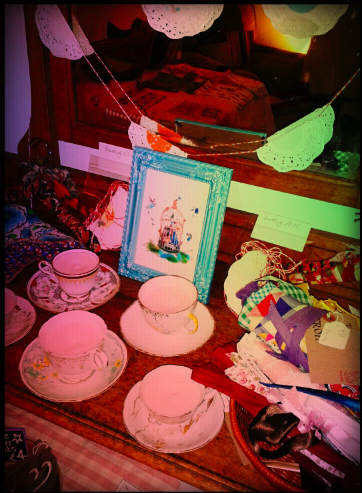 Open from 11am-5pm. 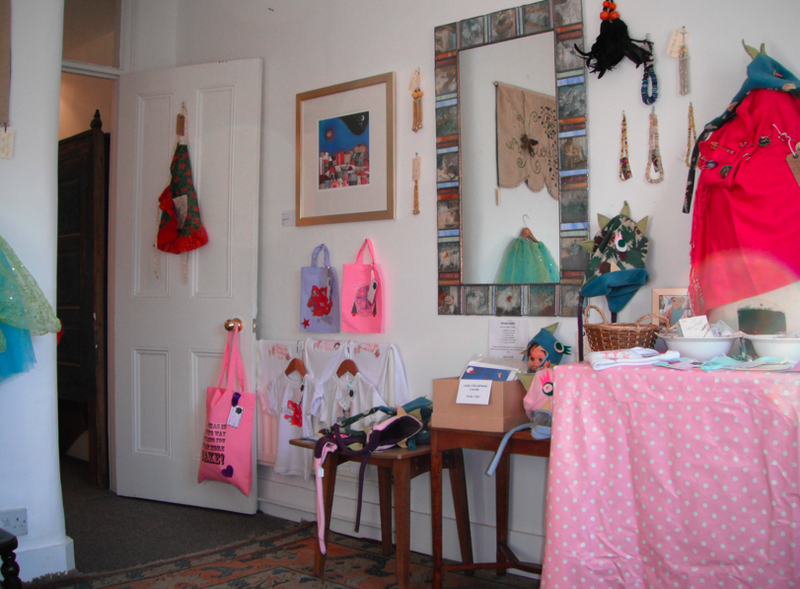 Also see my items in art @number 73- 73 Stanmer Villas, Brighton (also near fiveways). 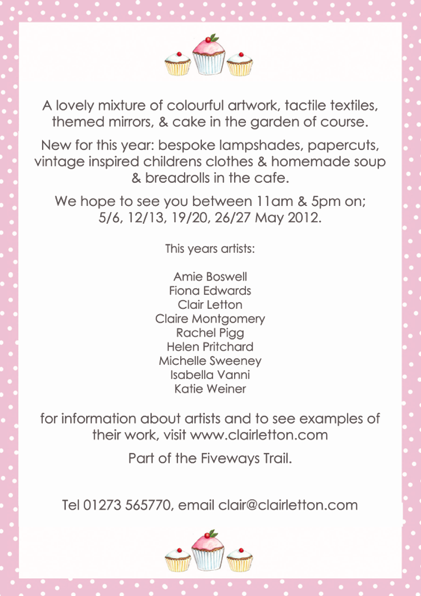 Over 16 artists displaying a range of wonderful work- well worth a visit! 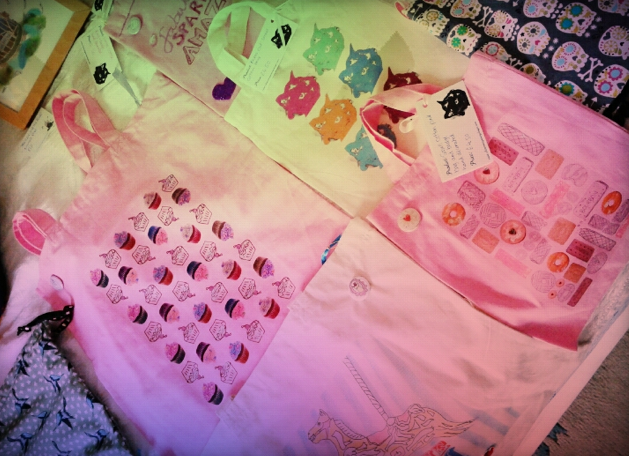 My cotton bags- large and small. 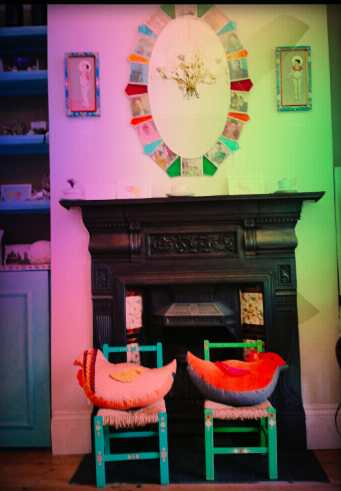 Cute bird cushions by Michelle Sweeney and Beautiful mirror by Fiona Edwards. 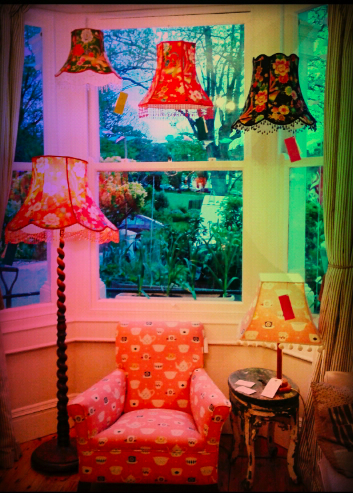 Beautiful lampshades and chair by Isabella Vanni. 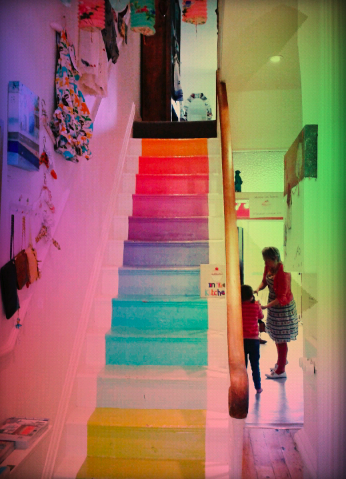 Clair’s rainbow stairs that everyone wants! To see all the photos so far visit my Facebook page. 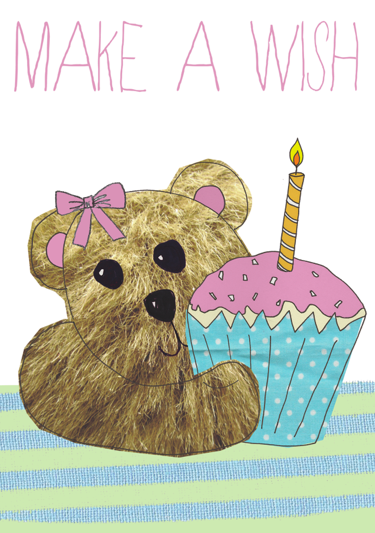 To see more of Clair Letton’s work see her website here. Thanks to those who visited yesterday, the house is open 11-5 today, and for the next 3 weekends through May. See the AOH page for full details. 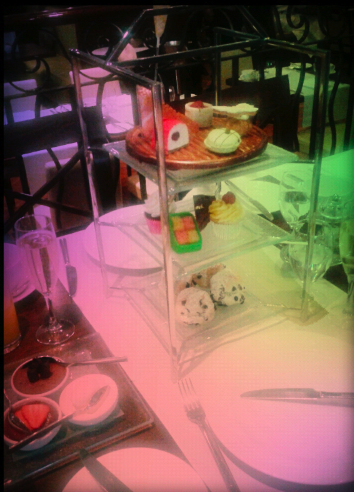 On my little London trip this week I was lucky enough to enjoy a chocolate afternoon tea at the Hilton on Park Lane! 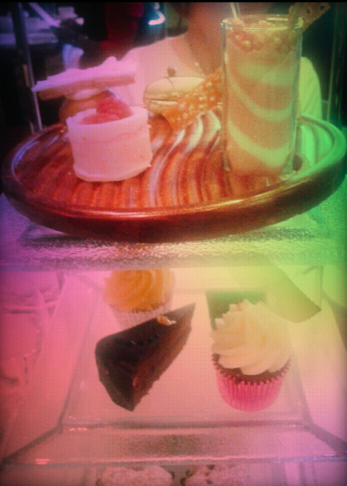 The cakes looked too good to eat, even the plate was edible as it was made of chocolate! 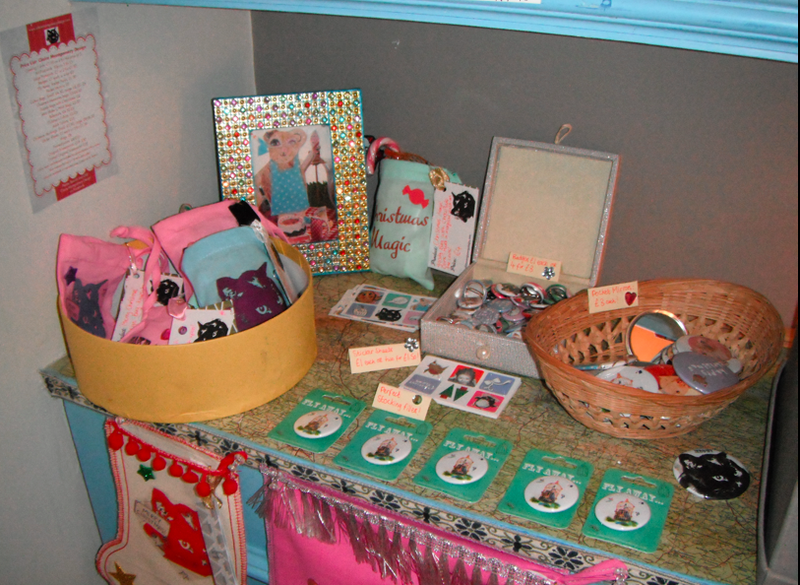 As announced earlier this month my cake themed products are now available in the Angel Bakery food kitchen, Brighton. Here are some photos I took when I popped by! 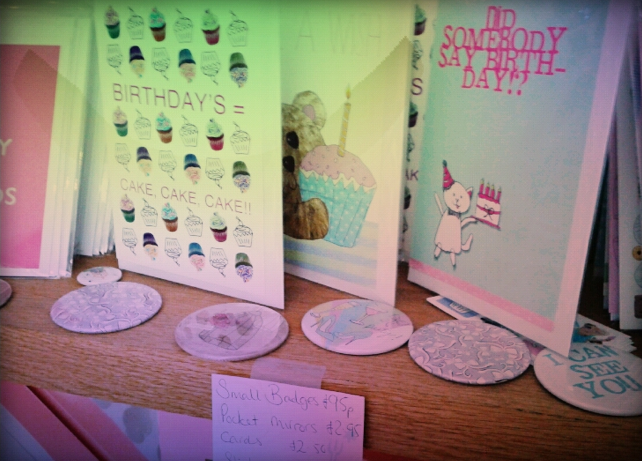 Find a range of my cake themed cards, pocket mirrors, badges and stickers there now! 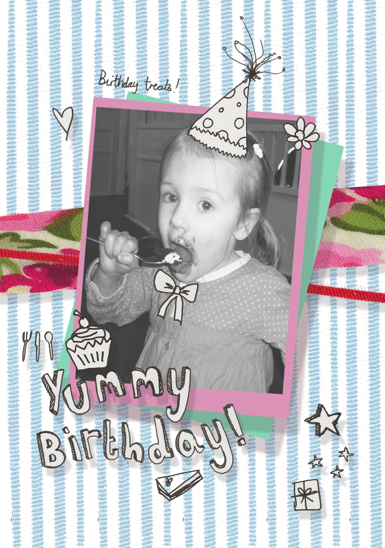 See my previous Angel Bakery post for all the details! 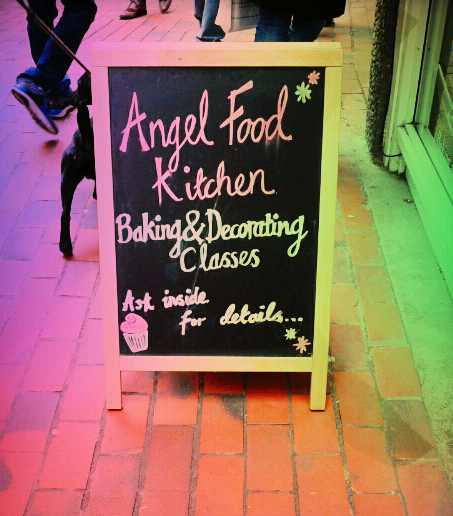 Angel Food Kitchen, 12 Brighton Square, Brighton, BN1 1HD. You can also view their website here. 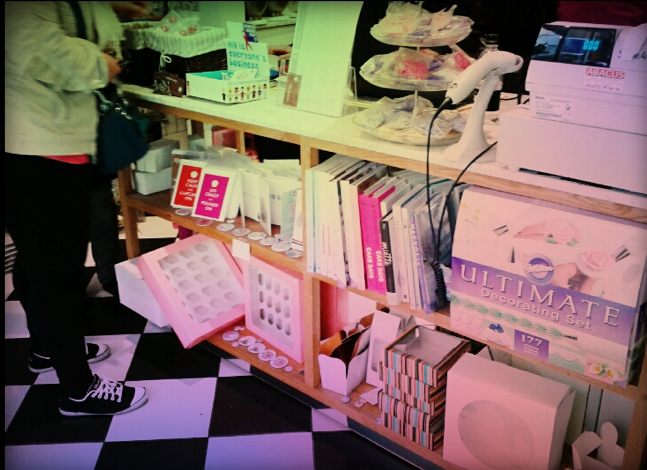 Latest Stockist- Angel Bakery Food Kitchen! I am pleased to announce my latest product stockist- Angel Bakery Food Kitchen, Brighton! 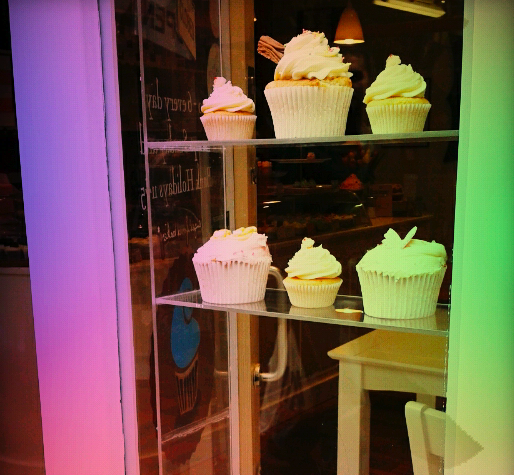 Angel Bakery is a wonderfully yummy cupcake bakery, and is Brighton’s original. Visitors travel from all over the country to try the yummy treats from the bakery (and they are very yummy indeed)! 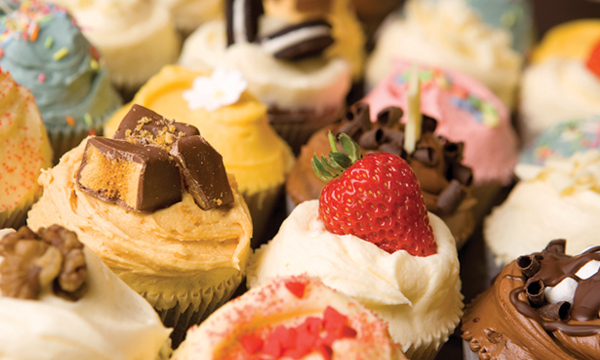 The bakery has been featured in Vogue Magazine, The Independent, Time Out London, ITV 2 and more- why not pay a visit yourself? 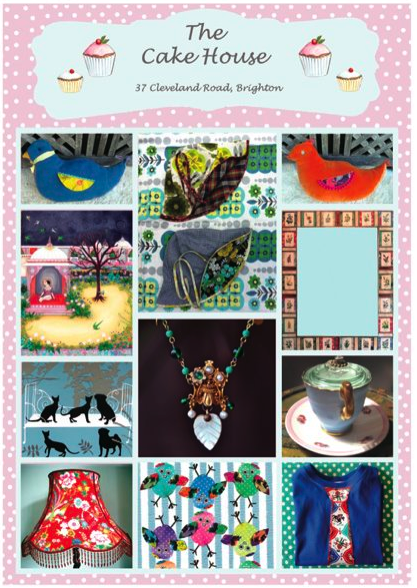 If your not Brighton based it is a good excuse for a trip to the seaside! 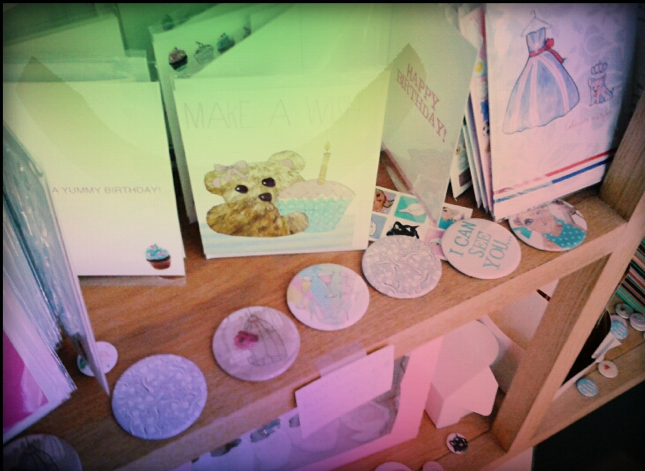 The Angel Food Kitchen- which hosts a range of cake classes, birthday’s, parties and more- will be stocking a range of my cake themed products including cards, pocket mirrors, badges and stickers. 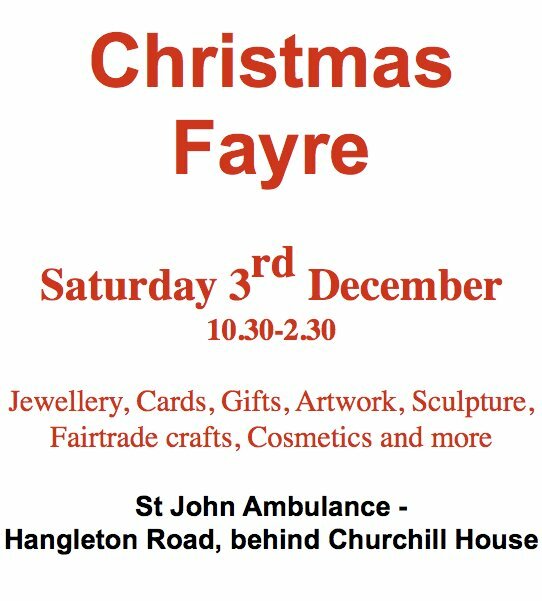 St Johns Christmas Fair Sat 3rd Dec! 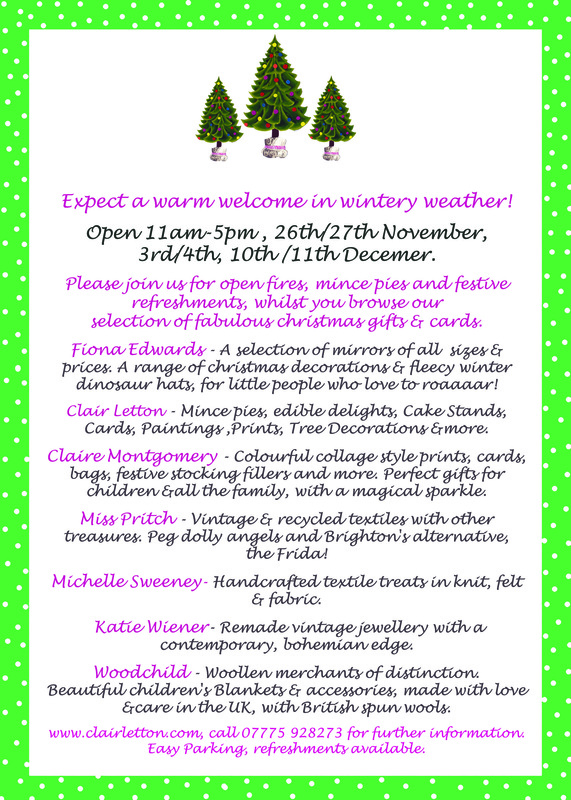 Please come along and visit St John’s Christmas fair that I will be part of. Come along and support a local charity and artists! All details above, address is StJohn Ambulance, Rear of Churchill House, Hangleton Road BN3 7SG. Hope to see you there! 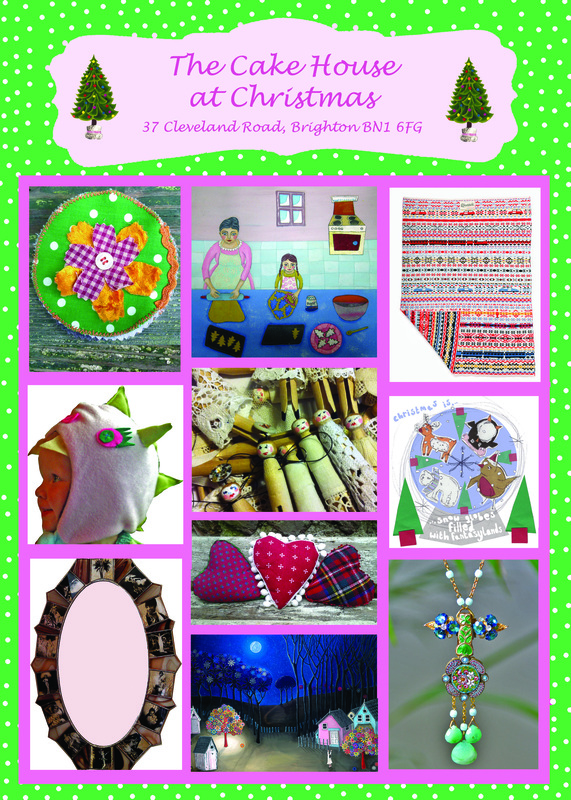 Also I will be in the Cake House (37 Cleveland Road, Brighton) all day this Sunday, the 4th Dec, if you’d like to come along and say hi. The house is open all weekend 11am-5pm this weekend and next. 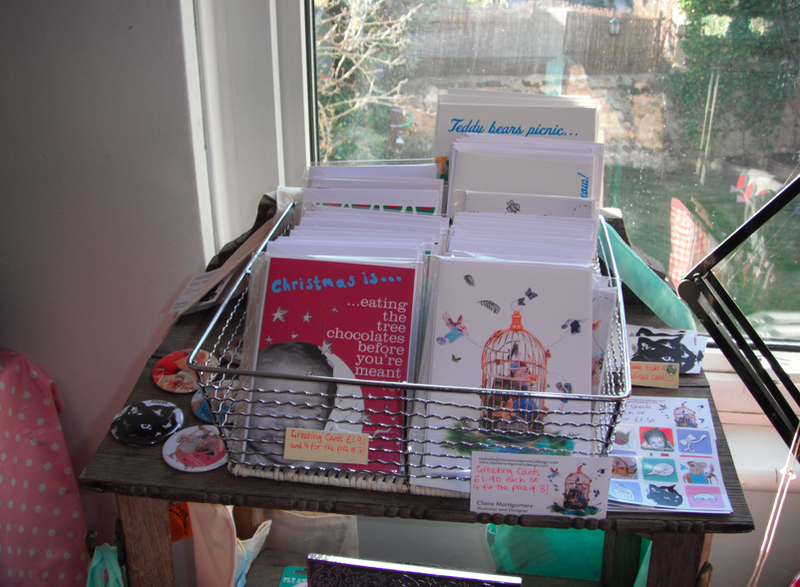 Number 73 Stanmer villas is also open both weekends 11am-6pm, please visit if you haven’t yet. 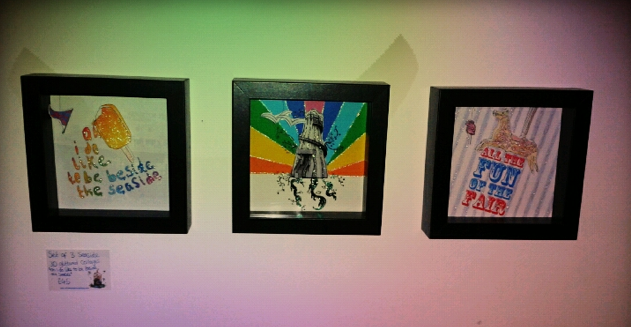 Flyers for both houses are on previous posts so scroll down to see more! 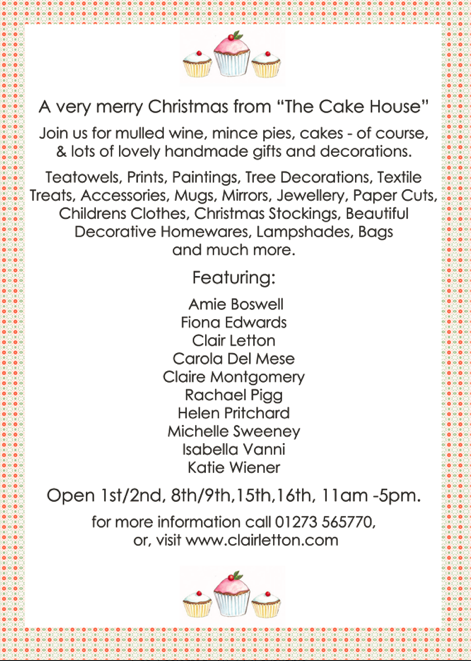 Flyer for the Cake House Artists Christmas Open House, at 37 Cleveland Road, Brighton (by Fiveways). All details are listed on this flyer. Please come along if you can! 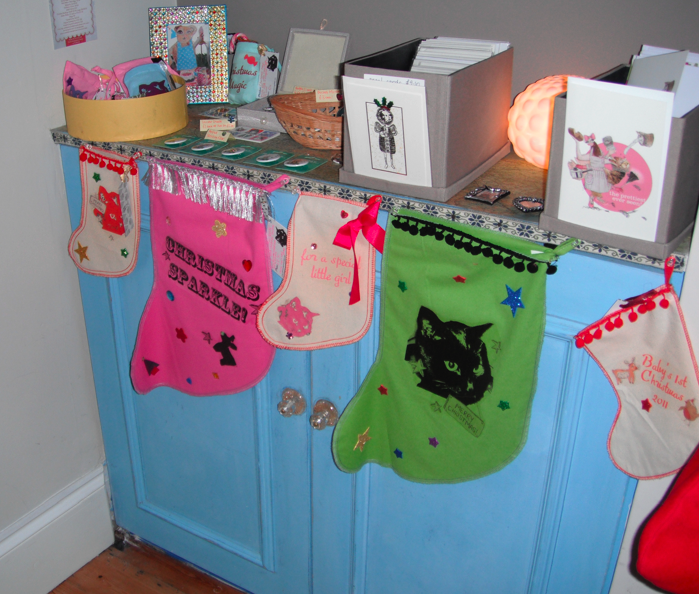 There will be lots of Christmas gifts, stocking fillers, a range of artwork and yummy festive treats! 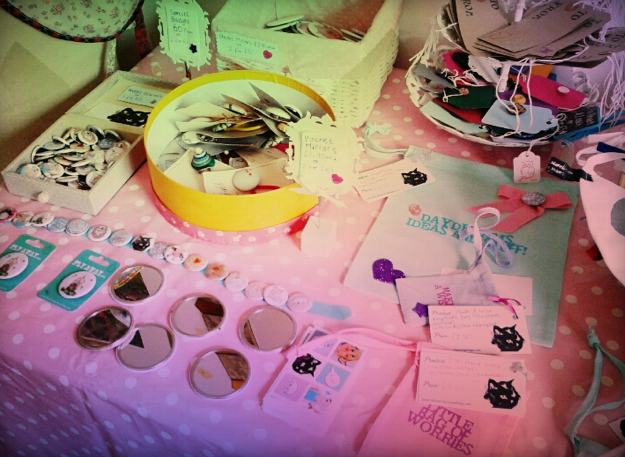 All set up in a lovely warm, cosy and welcoming house!